In 1917, two photos were taken by cousins Elsie Wright (10 years old) and Frances Griffiths (16 years old). That wouldn't have been unusual except that the pictures were of fairies. "Dear Joe, I hope you are quite well. I wrote a letter before, only I lost it or it got mislaid. Do you play with Elsie and Nora Biddles? I am learning French, Geometry, Cookery and Algebra at school now. Dad came home from France the other week after being there ten months, and we all think the war will be over in a few days. We are going to get our flags to hang upstairs in our bedroom. I am sending two photos, both of me, one of me in a bathing costume in our back yard, Uncle Arthur took that, while the other is me with some fairies up the beck, Elsie took that one. Rosebud is as fat as ever and I have made her some new clothes. How are Teddy and dolly? Elsie and I are very friendly with the beck Fairies." On the back of the photograph Frances wrote "It is funny I never used to see them in Africa. It must be too hot for them there." "I went off, too, to Cottingley again, taking the two cameras and plates from London, and met the family and explained to the two girls the simple working of the cameras, giving one each to keep. The cameras were loaded, and my final advice was that they need go up to the glen only on fine days as they had been accustomed to do before and tice the fairies, as they called their way of attracting them, and see what they could get. I suggested only the most obvious and easy precautions about lighting and distance, for I knew it was essential they should feel free and unhampered and have no burden of responsibility. If nothing came of it all, I told them, they were not to mind a bit." "The morning was dull and misty so they did not take any photos until after dinner when the mist had cleared away and it was sunny. I went to my sister's for tea and left them to it. When I got back they had only managed two with fairies, I was disappointed." "They went up again on Saturday afternoon and took several photos but there was only one with anything on and it's a queer one, we can't make it out. Elsie put the plates in this time and Arthur developed them next day. P.S. She did not take one flying after all." "My heart was gladdened when out here in far Australia I had your note and the three wonderful pictures which are confirmatory of our published results. When our fairies are admitted other psychic phenomena will find a more ready acceptance … we have had continued messages at seances for some time that a visible sign was coming through...."
Elsie: I didn't want to upset Mr. Gardner. I don't mind talking now. Elsie: I would swear on the Bible father didn't know what was going on. Elsie (after a pause): I took the photographs. I took two of them... no, three. Frances took two. Interviewer: Are they trick photographs? Could you swear on the Bible about that? Elsie (after a pause): I'd rather leave that open if you don't mind... but my father had nothing to do with it I can promise you that. Elsie (gently): I think we'll close on that if you don't mind. Mitchell: A rational person doesn't see fairies. If people say they see fairies, then one's bound to be critical. Mitchell: Now, if you say you saw them, at the time the photograph was taken, that means that if there's a confidence trick, then you're both part of it. Mitchell: Did you, in any way, fabricate those photographs? Frances: Of course not. You tell us how she could do it, remember she was 16 and I was 10. So, then, as a child of 10, can you go through life and keep a secret? But in 1981, both cousins said that the photos were fake and that they had held up cut-outs with hatpins. 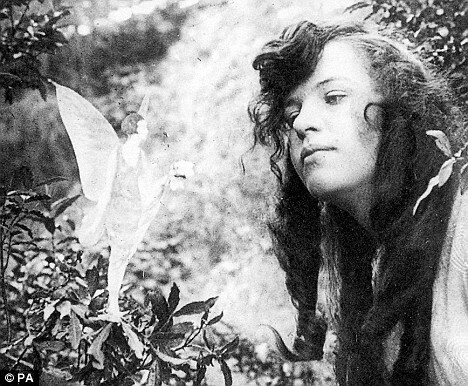 Frances insisted until her death (July 1986) that the 5th photo was genuine, and that they had really seen fairies. Elsie: "Two village kids and a brilliant man like Conan Doyle, well, we could only keep quiet." Frances: "I never even thought of it as being a fraud — it was just Elsie and I having a bit of fun and I can't understand to this day why they were taken in — they wanted to be taken in."